We’re heading off to Venice to set up our installation at the 2016 Venice Architecture Biennale! 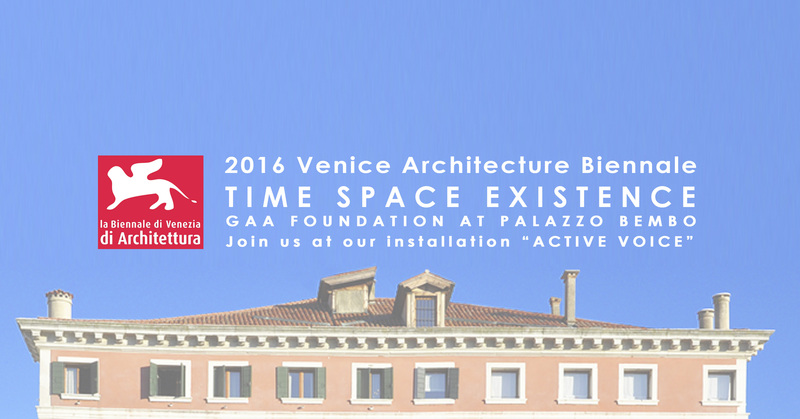 We will be installing our exhibit at Palazzo Bembo for the Global Art Affairs "Time Space Existence" Exhibition at the 2016 Venice Architecture Biennale. Responding to the curatorial focus, "Reporting From the Front", a three-dimensional video architectural exploration seen through the lens of two neighborhood grandmothers who established the school is at the core of the exhibit. The installation is composed of an integrated video display on four planes, three walls and a horizontal platform, that together describe the ongoing collaborative design process that resulted in formal and informal learning spaces for the growing number of students. The architectural task was multifaceted. It included an ongoing search for a site for a new building resulting in multiple investigations of possible parcels of open land as well as potential unused buildings, such as a manufacturing warehouse and an abandoned nunnery, which could be re-purposed into a new school campus. Simultaneously yearly renovations and re-designs of the existing school classrooms and public space were part of the scope of work. The latest project is the design of adaptable, pre-fabricated, "classroom buildings" suitable for small or large group learning that are located within the existing school gymnasium. This series of incremental architectural projects together strive to create an inclusive educational public domain for the students, educators and community.